Thought the GTX Titan X Collectors Edition was expensive? The GTX 1080 Ti remains on the wish lists of many enthusiasts this holiday season with no signs of another generation likely to appear soon. 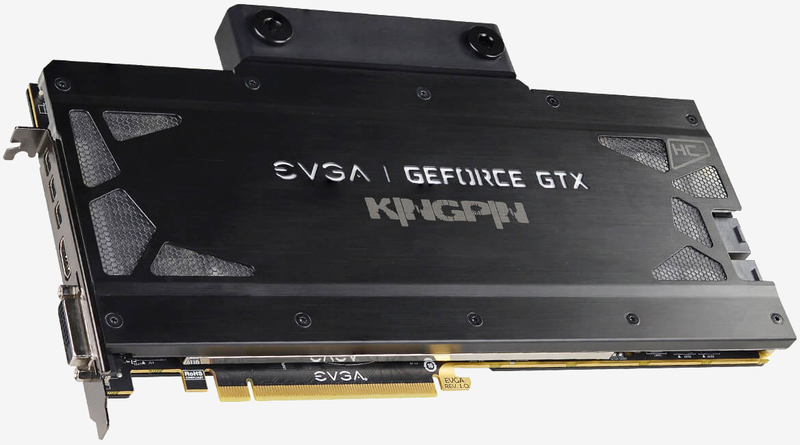 EVGA is going all-out to target enthusiasts with the GeForce GTX 1080 Ti K|NGP|N Hydro Copper. Designed to be liquid cooled and fit into a single expansion slot, this new GTX 1080 Ti is designed to reach 2,025MHz. The guaranteed clock speed is exactly the same as that found on the air cooled model released earlier this year. The same nine thermal sensors can be found on this model ready for liquid cooling so that overclocking can be performed with precision. Base / boost clocks of 1,582MHz and 1,695MHz also match the air cooled 'Kingpin' but anyone buying this card won't be running it at stock speeds. In terms of actual circuit board design and performance, the Hydro Copper edition is not expected to trounce the air cooled variant. A significant difference though is the choice of video output options. There are three mini-DisplayPorts, an HDMI out and a DVI port. Placement of the two required 8-pin power connectors is also unique for this Kingpin model. The 2x8-pin connectors are on the rear of the card, presumably to avoid running high current paths right next to the openings of the water block. Knowing that the Star Wars-themed GTX Titan Xp Collector's Edition graphics card retails for $1,200, a GTX 1080 Ti couldn't possibly be more, right? Wrong. The K|NGP|N Hydro Copper has a retail price of $1,249.99 and is available for purchase from EVGA today.